Mini Coconut Ricotta Pancakes with Strawberry Syrup. Buttermilk Sweet Potato Pancakes with Coconut Whipped Cream. Roasted Strawberry Brown Butter Pancakes. 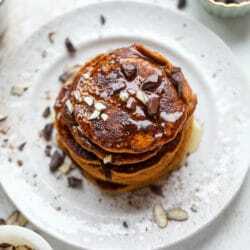 Whole Wheat Brown Sugar Banana Bread Pancakes.